When you trim a dog or cat's nails, you should always avoid cutting the quick (the sensitive flesh inside the nail), but accidents happen. Many people choose to trim their pets' nails themselves for a variety of reasons, but sometimes the pet is not keen on the idea. 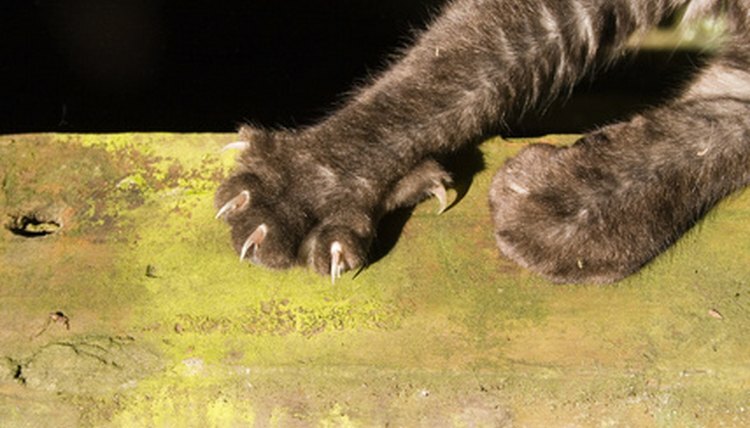 A pet might jerk its foot away at the last second, or lunge at the wrong moment, causing the nail to bleed. The flow of blood will stop on its own in a few minutes, but if it you want it to stop faster you can use styptic powder. It's a blood clotting agent that causes the bleeding to stop on contact. Purchase styptic powder or a styptic pencil that contains silver nitrate. Some also contain a local anesthetic to dull the pain. You can find them at pet stores, online or from your veterinarian. Moisten a cotton swab in water and dip into the jar of styptic powder if you are using the powder form. The pencil form can be brushed directly onto the nail. Apply to the bleeding nail for 5 to 10 seconds using moderate pressure. The bleeding should stop. If the styptic powder does not stop the bleeding, contact your veterinarian.